Hold onto your hats, folks, it's competition time and this one is not to be missed! 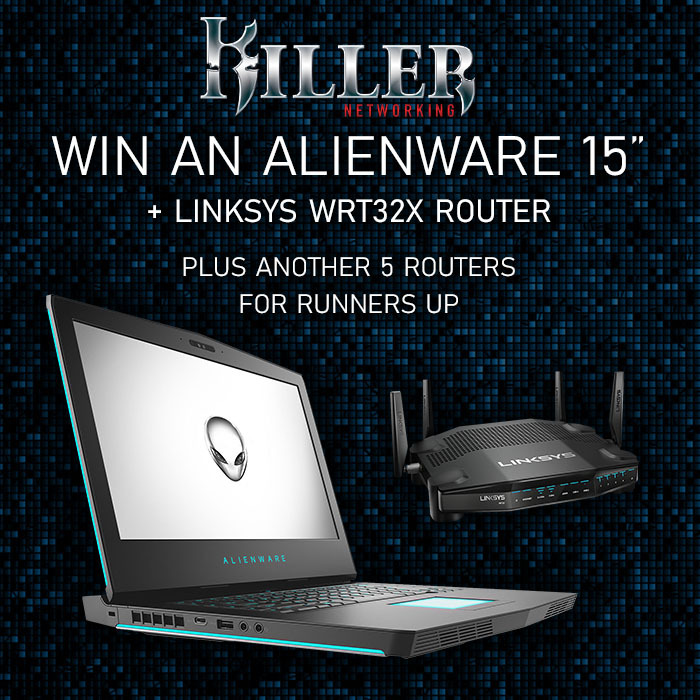 In partnership with the good people at Killer, we're giving you the chance to win an Alienware 15 gaming laptop and a Linksys WRT32X gaming router. Sound tasty? Wait 'til you get a load of the specification. The Alienware comes equipped with a hexa-core Intel Core i7-8750H processor, Nvidia GeForce GTX 1070 graphics, 16GB of DDR4 memory, a 256GB M.2 SSD, Killer WiFi and a full-HD, G-Sync enabled IPS display! A perfect match for the Killer-enabled Linksys WRT32X router, and why stop there? To help spread the love, we have a further five WRT32X routers awaiting our runners-up! Want to be in with a chance of winning? Simply answer the following question to enter our prize draw, and don't forget, you can also claim a second entry via Facebook. Thanks for taking part and if you want to learn more about Killer Networking, check out the official YouTube channel, read our in-depth review of the Killer Wireless-AC 1550 and be sure to follow Killer on Facebook for all the latest developments. The prize draw is open to HEXUS readers in the US, Canada, UK and Europe aged 12 years or over. The competition winner will be picked at random from all eligible entries that arrive by 22:00 London time on the closing date, November 7, 2018. The winners will be notified via email by November 14, 2018. The winner must claim their prize within 7 days of the promoter sending notification. If the prize is unclaimed after this time, HEXUS reserves the right to offer the unclaimed prize to a substitute winner selected in accordance with these rules. First prize is an Alienware 15 gaming laptop and Linksys WRT32X gaming router. Five runners-up will each receive a Linksys WRT32X gaming router. I do not want my laptop killing me thanks all the same. Please disable killing on your laptop. If I win this, I'm gonna make sure to play the heck out of Stardew Valley on it. Exclusively. Nice prize, but I had to have the Killer gear pulled out of my Dell machine earlier this year as it was freezing the system. Switched to intel networking and it hasn't missed a beat since.